I understand the devotion to Merriam-Webster’s Dictionary, I really do. 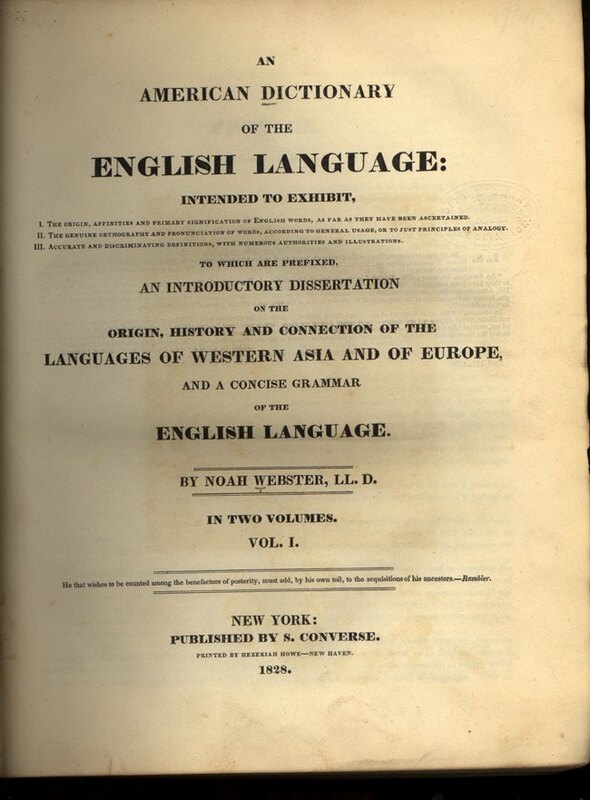 It is our American dictionary, after all, started by Noah Webster in 1806, the founding father who sought to save our language from the “clamor of pedantry” that surrounded the British approach to our common tongue. He argued for popular sovereignty over the language and refused to let aristocratic norms decide how we speak. It began in the appropriately American way: pragmatic, based on classroom experience, geared to the education of a broad swath of the public, not a thin film of upper crusties. And it brought genuinely American words for the first time into a dictionary: skunk, squash. He learned 28 languages and mortgaged his home to keep the thing going. Noah’s word-ark brought us to a world of democratic, new-world English. So the spelling bee powers that be are right to insist upon this dictionary as the standard for American spelling contests. They are, after all, imminently democratic enterprises. A group of very diverse students compete over one thing we all have access to: our language. And it inculcates the basic value that language is power, a healthy thing for smart kids to learn. But it seems to me an UTTER violation of the principles of democracy, popular sovereignty and common sense (that GREAT American value!) that these children, who have a hard enough time learning our antiquated, polyglot and sometimes simply perverse spelling, are “guided” in their pronunciation by the idiosyncratic respelling system still deployed in Merriam-Webster’s. This is simply wrong, and it should stop. And I am very nearly serious when I say this. Let me explain. Around the world, people are learning English. More people speak English as a second language than speak it as a first language. All these English learners have one thing in common: the International Phonetic Alphabet (IPA), which is in almost every learner’s dictionary of English. It is the perfect antidote to our ridiculous system of orthography. It is a rational, internationally agreed upon, universally used (if adapted a bit here and there), and now unicode system that covers the basic sounds of the world’s languages. An IPA transcription will immediately give the lie to such travesties as the apparent similarity of food and wood, which do not rhyme because they contain completely different vowel sounds. You’ll see this right away when you see the IPA phonemic transcriptions: /fu:d/ vs. /wʊd/. What’s more: when a student learns the IPA, they can use that very same knowledge to learn French, or German, or Swahili. IPA is a kind of unicode to the sounds of the world’s many tongues. Why keep its knowledge from the young people of this country? One answer a serious researcher has come up with is that empirically, casual dictionary users find the English-based respelling systems easier to use . That’s a valid point, I guess; but only if you are thinking about access to English. I would state again that the IPA is better overall if we want our students to learn more than just English, and to have a great tool to describe sounds that vary across the spectrum of global English. I agree, this is more ambitious than just tracking what the casual dictionary user finds more helpful. Now my true confession: this mostly annoys me because I struggle with unlearning the IPA in order to be a bee pronouncer! The idiosyncratic symbols used in the wordlist I’m given tend to throw me off as I grow tired. I spend all day teaching Latin, so to be told the symbol ī represents the vowel sound in eye is a bit much. It’s not “long i” after all, but a diphthong, as IPA will show you: /aɪ/. And from years of reading German, I get completely flummoxed by ä representing the vowel in don, as in the Websterese: \nänə’jesəməl\ for nonagesimal. Helen Fraser, “Dictionary Pronunciation Guides for English,” International Journal of Lexicography 10.3 (1997):181-208.